The apartment 'Monferrato' is divided into a large living room with sofa bed (2m x 2m) chair, chest of drawers and a dining table mi chairs, satellite TV, radio and wireless. A large covered balcony with beach chair, table and chairs aligned the south-east. A modern, fully equipped kitchen where you cook and bake to your heart can. A modern bathroom with shower, sink and toilet .Schlafzimmer with double bed (2m x 2m) and cabinet. Bed linen, table linen and towels are included in the apartment rent. Final cleaning is exclusive. Living room and bedroom have a wooden floor, bathroom, kitchen and hallway with tiled flooring. In the apartment there is an ironing board and ironing-cards can use our washer (Price 10 €) and the laundry drying anytime. 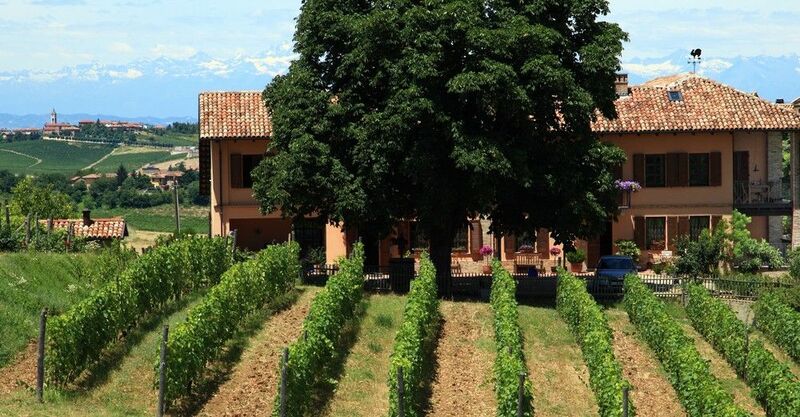 The Cascina Rosone is located on a hill surrounded by vineyards. The old winery, shaded by a large chestnut tree, has been renovated from the ground up. The result is a cozy atmosphere where you will feel comfortable in any season. Enjoy the magnificent view over the Monferrato hills and the Alps and relax with a good glass of wine. Each of the two apartments, both located on the first floor, has a living-dining room, bedroom with double bed (2m x 2m), a bathroom with shower / WC and a fully equipped kitchen where you can cook and bake to your heart's content. The apartment 'Monferrato' (photos 2-7) has a large covered balcony, which is south-east aligned. The apartment 'Monviso' (photos 13-17) has a small balcony, southwestern location and a cozy and spacious seating and mooring in front of the apartment. There is also a double room to rent with an apartment. In the Cantina (wine cellar) matures the Barbera, which is vinified from organically grown grapes. We are looking forward to your coming. Good wine and good food: In Piedmont to cook with passion, care and a lot of time. In vegetable markets, in village shops, in the 'Salumerie' and butchers, in the 'pasta fresca' shops, bakeries and all the ingredients - always fresh - you need for a good dish. The food in the restaurant is usually an event, not just food. Menus can be found almost never because the owner will advise you well. Usually up to 8 courses are served, with particularly the variety of antipasti is typical for a Piedmont menu. The Piermont but primarily for its red wines such as Dolcetto, Nebbiolo, Barbaresco, Barbera, Barolo and 'the king of wines' known. but worth mentioning are the white wines such as Arneis, Cortese and Moscato. That is also a Trockenbeerenauslese, Moscato Passito, produced. On request a second bathroom / shower, bidet and toilet can be rented with. Given also the attic room with double bed (2m x 2m). Ideal for teenagers and adults. The apartment 'Monferrato' has central heating which can be switched at any time. Eva was a great host and extremely accommodating! We enjoyed tasting the wines produced on the property and the view is simply gorgeous! A perfect spot! Highly recommended! Tasteful apparent on small wine estate in the middle of the piedmont wine region. We had a great time staying a week. The apparent was perfect for our family of three with our son sleeeping on the sofa bed in the living room. We enjoyed the estate Barbera wines when we ate in and had a very nice private wine tasting with Paulo the wine maker. There are excellent running/cycling options at the doorstep on a web of small roads through the vineyards. We stayed here for three nights during a month-long road trip throughout Italy, and this was one of our favorite places. The owners are very nice and helpful. Their residence is attached. The apartment Monferrato was perfect for us as a couple. The balcony is very large, and although we had rainy days we still enjoyed walking out when we could to enjoy the view. The bed was very comfortable, the bathroom spotless (as was the entire apartment), and the kitchen well equipped. It was fun to cook after being on the road for three weeks. Thank you again, Karin and Andrea, for being wonderful hosts, and we wish you the very best in the future. We so enjoyed our stay and loved the village of Agliano Terme, and our drive to Barolo. Your wine was delicious as well! We would definitely stay here again if our travels every take us your way. The panoramique view, the calme, the sunrise, the sunset, inmiddle of the vineyards, a large balcony, flower at arrival and wine for tasting, friendly people.... all this we loved very much. Thank you Eva. Thanks a lot for the nice words about our place. You are at any time wellcome back. Schon auf den Bildern ist der tolle Ausblick des sehr großen Balkons zu erahnen der in Wirklichkeit noch viel beeindruckender ist. Die Wohnung ist sehr umfangreich ausgestattet, sehr modern und geschmackvoll eingerichtet. Empfang und Abreise waren sehr gut organisiert und zuverlässig, von uns alles in allem uneingeschränkt zu empfehlen! Das ganze Haus liegt idyllisch inmitten von Weinbergen, etwas abseits vom Ortskern. Sowohl die Aussenanlage als auch die Innenausstattung ist sehr ansprechend gestaltet und entsprach genau unseren Vorstellungen. Die Wohnung ist sehr geräumig und mit allem ausgestattet was man zu einem angenehmen Aufenthalt benötigt. Das absolute Highlight ist jedoch die überdachte Veranda, mit herrlichem Blick auf die piemontesische Hügel Landschaft. Es freut uns seht das ihren Urlaub bei uns in Wohnung Monferrato, gut gegangen ist, und das Sie alles net findes. The Cascina del Rosone is located on a hill in the middle of the UNESCO-listed World Heritage Wine Country, close to Agliano Terme, in the heart of Barbera are grown. Agliano Terme has everything for everyday use and is easily accessible from the house on foot. The 'city of truffles' Alba and the Langhe, where famous wines and cheeses are produced, can be reached via a magnificent route via Neive and Barbaresco. Turin, capital of Piedmont, rich in historical cafés and museums under 18 km arcades, is always a trip worth. Acqui Terme with its hot springs and terms can be reached by car in about 25 minutes. But you can also follow the historic trade routes from Northern and Central Europe to the Mediterranean and visit the many castles, palaces and churches of Piedmont and the many historic events. This part of Italy is famous for its food and wine culture. Golf: In the immediate vicinity you will find the 9 hole golf course in ACQUI TERME 'LE COLLINE', the 18 hole course in ASTI 'FEUDO d' ASTI ', in CHERASCO the golf club with 18 holes and the 36 hole course in Fubine' MARGARA ' also offers an indoor pool, as well as a tennis court. From February the golf courses have reopened. Ski: Even in winter, the Piedmont is well worth a visit. In about 2 hours you can reach the 'Olympic slopes in 2006. San Sicario, Sestriere, Sauze d'Oulx, Bardonecchia, all located in the Susa Valley or even lime or Limonetto in the Cuneo area. Also Cervinia (Matterhorn), Gressoney (Monterosa) can be reached from your holiday resort in about 2, 5 hours.. Wonderful slopes for a day trip. Inclusive: Gas, Strom, Heizung, Wasser, Bettwäsche, Tischwäsche,Handtücher. Exclusive: Endreinigung. Der Preis versteht sich für 2 Personen in der Wohnung. Jede weitere Person kostet einen Aufschlag von 10 Euro pro Tag. Anreise zwichen 14 -17 Uhr. Abreise bis 11 Uhr. Schreiben Sie uns bitte ihren anreise zeit. und rufen Sie uns an eine stunde früher als anreise. Für unser Mansardenzimmer mit Badezimmer berechnen wir 50 Euro pro Tag.